Teachers often say that you should just be yourself in a college admissions interview. That’s bad advice if you are inclined to be messy, smelly, grumpy or habitually late. Instead, put your best self forward. Anticipating common interview questions and preparing strategic answers can give you an advantage in the competitive admissions process. Take your interview seriously to get desired results. As part of the school’s application process, you may be invited to an informational meeting with alumni in your area. Informational interviews are an informal part of the school’s recruitment efforts. You may meet over lunch, for instance. Although informational interviews are optional, you can gain invaluable tips. For instance, you may want to ask, "How do you ace an interview?" if school officials later interview you by Skype or invite you to campus. Alumni will report back to the admissions office and share impressions of you, so be on your best behavior. Evaluation interviews conducted by school officials are more structured than informational interviews with alumni. This is where you must shine when answering top interview questions. Some schools use interviews to ask evaluative questions that measure character, maturity, stability, communication skills, motivation, resilience and self-awareness. For instance, you may be asked to discuss your reasons for seeking a degree, or you might be asked about a time that you had to make an ethical decision. Conservative, faith-based schools may ask personal questions about your spiritual beliefs. The goal of interviewing is to find students who mesh well with that type of school. Don’t be surprised if the interviewer even asks how you spend your free time. The intent of this curious question is to see if you are sociable and well-rounded. For instance, a smart but reclusive student may not be a good fit for a school that encourages students to participate in sports, join student organizations, engage in service learning and vocally advocate for social justice. Similarly, you may be asked how you balance competing priorities or manage stress if campus involvement is expected. Interviews are more common at selective private schools as a way of narrowing down applications. A school generally has a target goal for the preferred size of the incoming first-year student class. Not all applicants who meet or exceed academic requirements will be admitted, which is why doing well on the evaluative interview is so important. Being invited to interview for admission or a scholarship means the school liked your application. Expect to be asked questions about your resume, application essay responses, reasons for applying and the particular subjects you are excited to study. Elaborate on what you wrote on your application but also present new information. Review what you wrote on your application right before your interview so your answers are fresh in your mind. How Do You Ace an Interview? A winning interview requires research and planning. 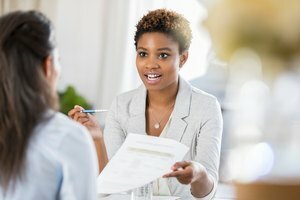 Brainstorm a list of top interview questions, such as, “Tell us about yourself and why you are interested in our college.” Then ask family members, teachers and your guidance counselors if they concur with your list and invite them to offer suggestions on possible questions and ideal responses. Study the school’s website to get a feel for the school’s size, demographics, rigor of courses, strongest academic programs and points of pride. If you have a major in mind, make sure you can identify what you like about the program at that school. If you are fascinated by science and technology, a good answer is something along the lines of wanting to take classes taught by a certain professor working in the area of computational biology. Also read a bit about the school’s history and founder in case you are asked if you know how the school got started. Many schools celebrate their rich history and traditions. If you are like most high school seniors, you don’t have a lot of interview experience. You may want to try mock interviews. Role play a college admission scenario. Practice everything from a firm handshake at the beginning of the interview to answering questions to expressing appreciation at the end of the interview. Work on maintaining good eye contact and conveying enthusiasm. Appearance matters because busy interviewers make snap decisions. Rebounding from a negative first impression may be insurmountable. Therefore, seek advice from teachers or high school counselors on how most students dress for an interview at that particular school. Being overdressed is better than being too casual. That means no jeans, shorts, baseball caps, flip flops or tennis shoes, even for an informational interview with alumni. Dress pants or slacks may be acceptable with a freshly pressed shirt or blouse along with a tie or scarf. Ask your teacher or guidance counselor if a suit is advisable. Shoes and other accessories should be simple and in good condition. Women should wear tailored attire suitable for an interview. Adjusting a slipping neckline or pulling down a hemline can be awkward and embarrassing. Avoid wearing a tight blouse with buttons that may pop open. Unless you are instructed otherwise, it is a matter of personal preference whether to remove piercings like nose rings. Strongly conservative colleges may have a negative opinion of body art and piercings, so you will need to decide if that is the right school for you if you don’t share their beliefs about body image. High school students sometimes make the mistake of rattling off reasons why they want to be admitted without explaining why they are worthy of consideration. Admissions staff assume you are eager to be admitted, so don’t waste precious time stating the obvious. Focus on how you plan to contribute to the vitality of the campus if given that opportunity. Review admission criteria to get a sense of the type of student admitted to that school. For instance, if the school’s admissions website says they look for students with leadership qualities, emphasize positions of responsibility you have held, like team captain. Also share your future leadership aspirations, such running for student government. If you really like the school but don’t quite fit the mold of the typical bubbly student bursting with energy, emphasize how your scholarly high school experiences or diverse perspectives would be an asset to the school. Downplay the ways you don’t fit in, and stress the reasons why you chose the school in the first place. For example, if you can’t imagine yourself attending a sporting event at a school with hugely popular teams, keep that to yourself while emphasizing your passion for research and working with world-class faculty. Why are you interested in being a student at our university? Why should we choose you over other qualified applicants? How will a college degree help you fulfill your goals? What do you hope to be doing in five to 10 years? Who has been your most inspirational teacher and why? What are your weaknesses or current limitations? Why is diversity important on a college campus? How would you like to make your mark on the world? When asked, “What are your greatest strengths?” recognize that an interviewer is gauging whether your skill set aligns with your career objectives. Interviewers expect aspiring accountants to be detail oriented, exacting, analytical and interested in math, for instance. Interviewers may also ask you to discuss your talents, skills, accomplishments and honors to discern your level of motivation and leadership potential. Honesty, sincerity and authenticity must come through when interviewing. While preparation is essential, do not spew memorized answers that someone else may have written for you. If you have given enough thought to your future plans and choice of schools, you should be ready for the top interview questions and best answers. Discussing career goals is tricky because few 18-year-olds have a clear idea of what they want to do with their life. There are exceptions, of course. Perhaps you have always dreamed of being a doctor or a veterinarian. Interviewers understand that students don’t have a crystal ball to predict their future. What’s more, many of today’s college students will one day hold high-tech jobs that don’t yet exist. Interviewers may ask you to share your future career plans to determine if you are goal oriented and ambitious. Interviewers typically need to know the strengths and weaknesses of a person for evaluative purposes. While it’s fun to talk about your accomplishments and skills, revealing weakness can be awkward. You may be asking yourself, "Why is it important to know your weaknesses?" Understand that interviewers ask this question to test your honesty, self-awareness and commitment to professional growth. Avoid silly answers like saying your weakness is dark chocolate. Also refrain from common clichés such as saying your weakness is being a perfectionist. You can best answer questions about your weaknesses by framing them as temporary limitations to overcome. Knowing your so-called weaknesses is the first step in setting self-improvement goals. Answer this question by naming a particular weakness and then describing how you expect to transform that weakness into a strength. For example, if you wish to overcome your shyness, talk about the steps you will take to gain leadership skills and confidence, such as enrolling in a public-speaking class, introducing yourself to one new person each day and joining student organizations. Top interview questions commonly include asking applicants to talk about a challenging situation they faced and the steps they took to resolve the problem. 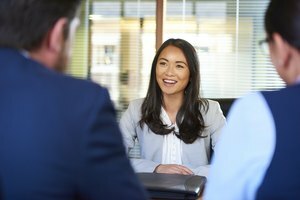 The goal of these behavioral interview questions is to see how well applicants handle real-life situations. Successful students are confident, resilient and resourceful. They are less likely to get bad grades and drop out of school. An admissions interviewer may use this approach to test your ability to get along with people, handle disappointment, complete tasks, work on a team or solve problems. It is impossible to predict all the hypothetical scenarios that may come up in interview questions, but have some short stories in mind that reveal how you function on a team, manage your time and set priorities. For example, you may be asked to tell the interviewer about a time you worked on a group project but other students weren’t pulling their weight. Answer by describing the situation, the tasks you undertook and the results achieved. For example, you might say: "While participating in a group project, I suddenly found myself doing all the work. I asked to meet with my team. I suggested we divide up the assignment equitably and hold each other accountable for meeting deadlines. As a result, team members learned more from the assignment and earned their grade fairly." At the end of the interview, you will likely be asked if you have any questions for the interviewer. Asking questions shows genuine interest. You may want to ask a follow-up question about a new program or research center that is being built. You could ask about research opportunities for undergraduates. You might also want to ask about the timeline for a decision. Graciously express appreciation for the opportunity to interview. Don't pass up a chance to sell yourself in an interview even if your application is extraordinary. Mary, Dr.. "What Are the Top Interview Questions?" Synonym, https://classroom.synonym.com/what-are-the-top-interview-questions-13714932.html. 18 September 2018.